Recording Unhinged: Creative and Unconventional Music Recording Techniques dares you to “unlearn” safe record-making, to get out from behind the windshield, stick your head out the sunroof, and put the pedal to the metal! 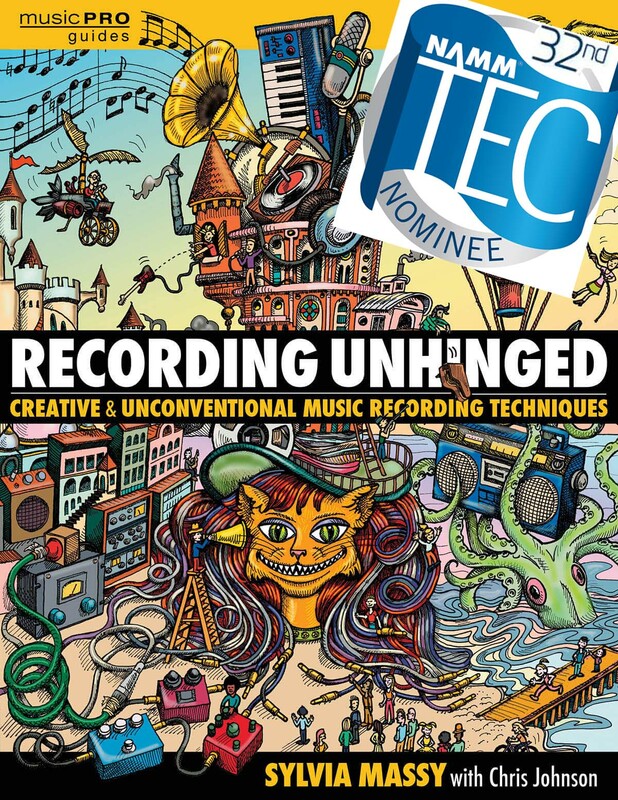 Sylvia Massy and her cohort of celebrity music industry producers, engineers, and recording stars discard fixed notions about how music should be recorded and explore techniques that fall outside the norm and yield emotionally powerful, incredibly personal, gut-wrenching, and even scary recordings. Joined by Hans Zimmer, Al Schmitt, Bruce Swedien, Jack Joseph Puig, Dave Pensado, Tchad Blake, Bob Clearmountain, Linda Perry, Michael Franti, Michael Beinhorn, Bob Ezrin, Geoff Emerick, and many others, this book has the stories, tips, recipes, photos, advice, diagrams, exercises, illustrations, and jokes that you won’t find in any other instructional manual. And what about that cover? Recording Unhinged contains many eye-popping illustrations by Sylvia herself. As if being a celebrated producer isn’t enough, Sylvia’s iconic illustrations bring real and imaginary recording situations to life. Catchy Bass Lines? Engineering Marvels? How to Mic a Chicken?!! Do a swan-dive into the unknown and make studio magic with inspiration from Recording Unhinged. —Signed, developed, and managed by Bill Gibson.